I have had a pleasure creating my own journal this past week! I have always wanted to make one from start to finish! she is a sweet, very creative woman. I adore her, and her classes. I had made a few small bound books before...but had not felt so free to create a journal from scratch! And her class really gave me confidence that I could make one! without really thinking or following instructions!!! Gosh it is fun to play! 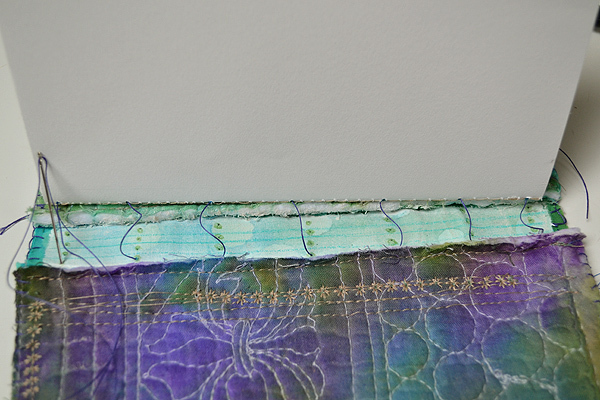 Then I did sewing of sorts to get each signature tight to the spine. 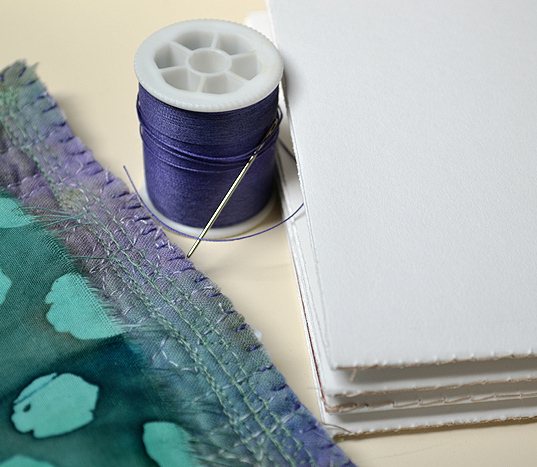 I am hoping my sewing will hold strong! Some projects are just so enJoyable! How is your creative week end going? I have had some issues lately getting on to some of your blogs. Sometimes it says I need to have permission? Have any of you had this issue? First off...I LOVE LOVE LOVE your "Journal for Healing"! I just posted a little collage on my blog, that I made for a friend for her birthday. I also have made a fabric cuff for a special friend in California. So that is what I have been up to!! This is one gorgeous journal, and the healing part speaks to me, that is a wonderful idea Terri, I know you will absolutely enjoy this! I can't get over how gorgeous it is! My creativity this week is working on a domino book, and starting a journal from scratch also...taking Monica Zuniga's class....she is a sweetheart! Stunning is the only word I can think to describe this beautiful book. I just love what you did with the binding and the cover. I love all the special little touches and details. You have an amazing talent. So glad you shared it with us, it is very special. This is gorgeous, Terri! You are going to really enjoy the journey you are about to take in this journal! What a beautiful journal Terri! I love how you used gesso to toughen the spine-great idea! 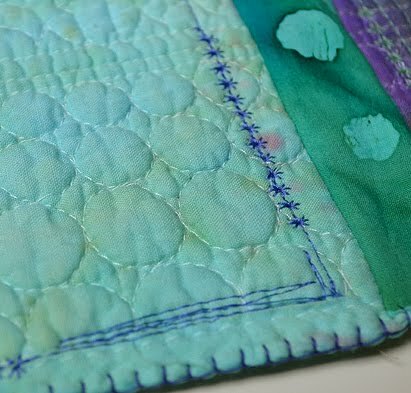 Your dyed quilts are so lovely too. I've been playing with my new obsession-the Gelli Plate-posted some smples on my blog. Oh, I noticed too that if someone's using Google Plus I can't leave a comment unless I join Google Plus. Oh my goodness I could not just look at the email I recieved and not comment. This is so beautiful and so full of happiness and hope. I absolutely love it. WOW! This is stunning! Everything about it is beautiful and your work has inspired me to make a journal of my own (someday) :) Thank you for sharing! Terri, you are such a talented woman! I love your healing journal. You could start selling them, I think! I hope you haven't had any trouble getting on my blog. Have a wonderful weekend! Terri, you have the knack for this down pat! 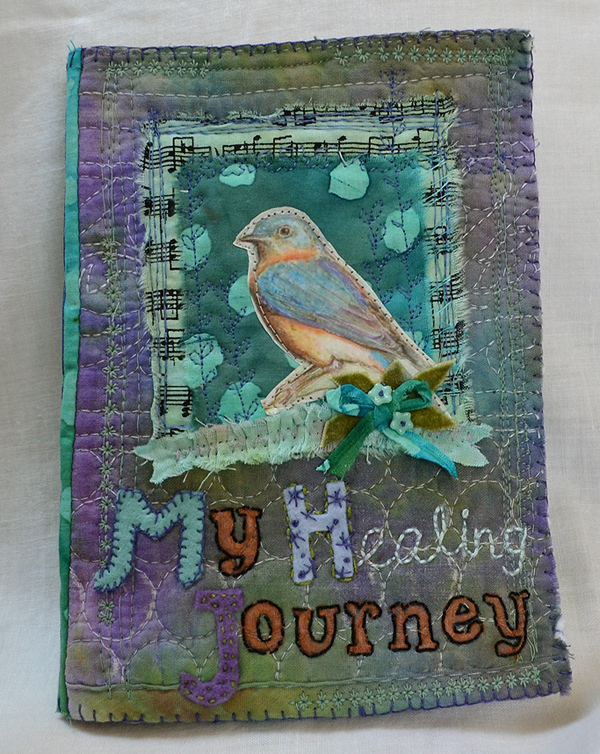 How lovely your new Healing Journal is with the embroidery on such beautiful hand dyed quilted fabrics. It's darling. I LOVE it! And you'll be inspired to journal healing thoughts. I did some digital art thingies in my spare time this week, but nothing more. I can't wait for all the house projects to come to a close and for cooler weather to settle in. That's when I'm at my most creative self. Fabulous journal Terri! 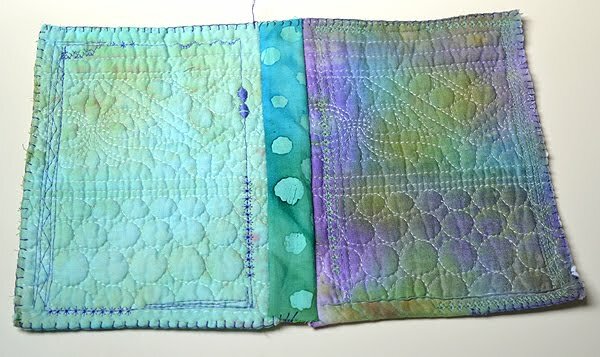 I just love all those colors of the sea and your embroidery is great. o WOW!!! this is so fantastic!! I love it! It is BEAUTIFUL and it didn't scream the '60s to me. 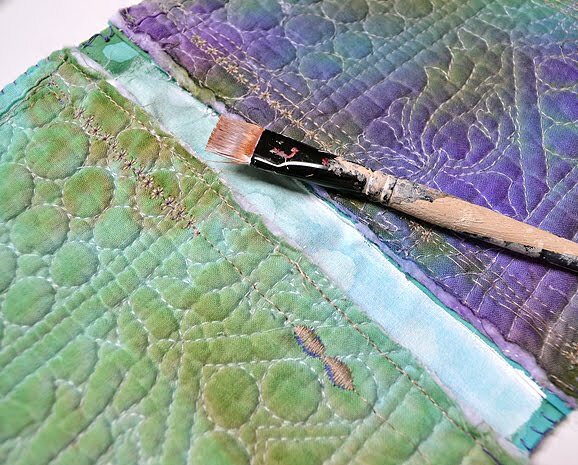 I am a quilter and a life-long journal keeper so this REALLY appeals to me. That said, I have 2 Qs: what is a signature and how did you see threw paper? 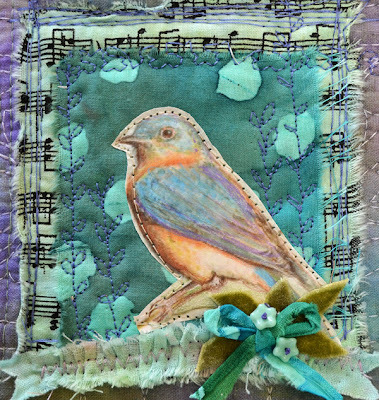 Your journal is absolutely beautiful,Terri.Love the colors you used - so pretty. Gorgeous! !Enchanting...so super beautiful ..You are so talented! !Wonderful work! Terri, this is really cute! I'm glad you made it and I love the colours too. Dear Terri, your journal, is wonderful. I love the cover bird, and your colours are fantastic- also the idea of a healing journal, is great, --and I love the stitches on the spine, binding it all together. 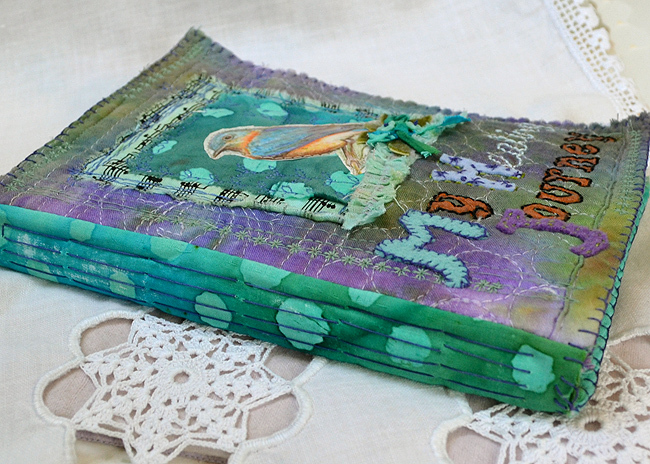 Love your little journal that you have created here and you will feel so healed when writing in it with those beautiful shades of blues, turquoise and mauve. Gorgeous cover and feels full of life! What a lovely journal. I had to stop in for a visit as the name of my blog addy is so close to yours (artfulabilities.blogspot.com). I had a very artful weekend. I have pictures up later this week (or should I say better pictures if I find MY camera).